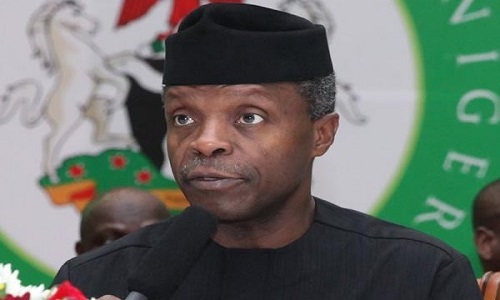 Nigeria’s Vice President, Yemi Osinbajo has said that the calls for the restructuring of Nigeria’s federal restructure are misguided. His comments will come as a bit of a shock especially because top APC Chieftains including Ahmed Bola Tinubu and former V.P Atiku Abubakar have called for a restructuring of Nigeria’s federal structure. The task about the implementation of true federalism. What we have heard since the advent of the military is quasi-federalism. The constitution is not helpful because of its awkward posturing on the subject. Mr Vice president we need to try something new. Restructuring is the way to go. Face your fears that is what great leaders do. Don’t allow yourself to be used or seen as a puppet in your administration. The only restructuring that is meaningful to the needs of the people of Nigeria is transforming their poverty to riches. Nigeria is a giant walking on crutches after having her land of milk and honey pillaged and raped by past and some present leaders and their cohorts (Not Buhari or Osibajo). Nigerians want their wealth back, and leaders that can exploit the rest of the wealth in a manner that will transform the lives of the people to true wealth. Buhari and Osinbajo are on the right path by launching and sustaining a global war against corruption in Nigeria. That is not enough. Oil blocks, which were distributed by Babangida to individuals to bribe them to oust Buhari in 1985, must be recovered and used for the benefit of Nigerians. Mr. Buhari, these oil blocks are part of the sovereign wealth of Nigerian people and must be recovered. No law can hamper you because the law was made for man and not man for the law.